As you know, mentor texts are a great way to allow your students to practice reading skills quickly and in an engaging way. 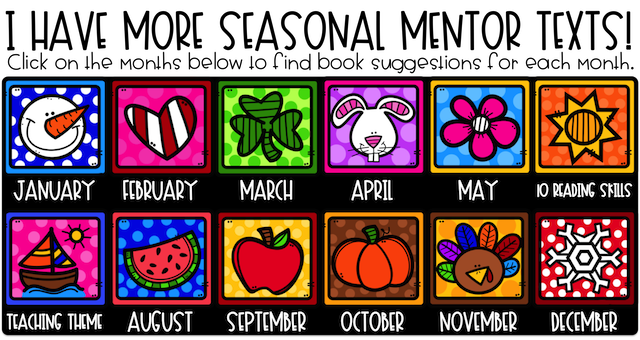 This month, I share a few great November themed (or just for fun!) books to get your students working on sequence, making predictions, and theme. Maybe it's just me, but I LOVE to get my kids excited about large events or traditions that occur. The Macy's Thanksgiving Day Parade is something that many students watch, while others have never heard of it. When I discovered this book, I knew I had to share it with my students. This book would be perfect for practicing summarizing or sequencing skills as the author tells how the Macy's Thanksgiving Day Parade originated with the help of a puppeteer, Tony Sarg. The illustrations are great and it is loaded with information. This book is simple and easy to read. It would also make an EXCELLENT mentor text for a project or book made by individual students or the whole class. In this book, the author shares with the reader all of the things that various people might be thankful for. "An artist would be thankful for color and light. The clown, for her costume silly and bright." I would love to see students share what police officers, teachers, principals, doctors, and other people in their lives might be thankful for. In this heart-touching book, the main character loves to play a Knock Knock game with his dad every morning as his dad wakes him up. Then one day, his dad doesn't come to wake him up. He also doesn't come home for dinner. He's confused and a little scared. While this book NEVER reveals where the father truly is, it offers students the opportunity to make predictions about where the father might be and offer evidence from the text to support their predictions. I also love the author's note at the end of the book. The author shares that she knows this is such a sad reality for so many kids in our country today. They are dealing with the loss of parents in more ways than one; arrest, death, substance abuse. This book is so well written about such a tough situation that so many of our students experience every day. What problems might a giraffe have? Maybe how long his neck is! Should he wear a tie as a distraction? Does the tie make it stand out even more? Are other people looking at him? Why can't he have a cute little neck, like a turtle? This book offers a really great theme about loving yourself for who you are. Everyone has strengths. Everyone has things they dislike about their own bodies. But, we were born that way for a reason. 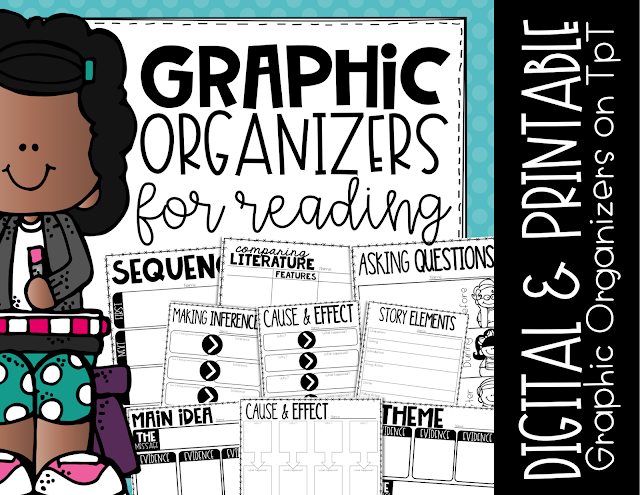 If you are interested in the graphic organizers that I used in the pictures for this post, you can find them in my TpT store, by clicking here Included in the file, you find both digital and printable versions of each graphic organizer to reinforce the mentor texts your students will love.